A few months ago we had the pleasure of working with a sweet family on the planning of their soon-to-be daughter in law's shower. They zeroed in on Marc Forgione, a rustic neighborhood restaurant featuring laid-back yet high-end New American cuisine. Basically, an amazing spot. We loved the welcoming and casual feel of the space; it's not very often that a venue can combine a rustic and urban feel. It was perfect. 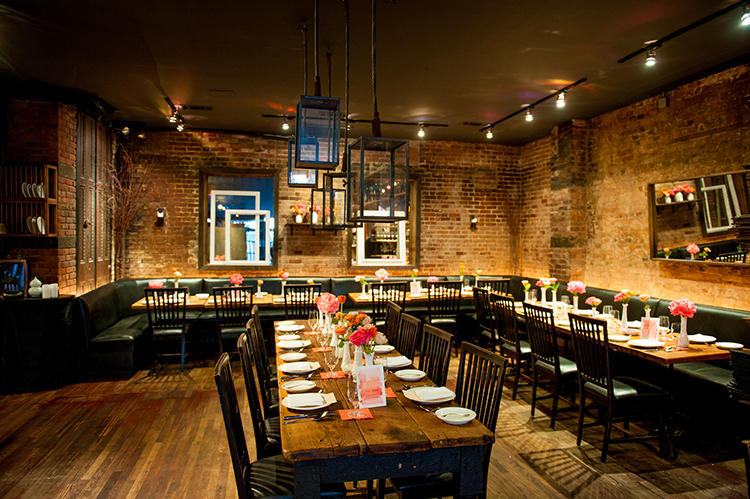 The space is a mix of exposed brick, deep oak tones, and black leather banquettes. We knew we wanted to interject some pops of bright color and light. A color palette of orange and bright pink was just the way to do that. We lined the table with white mercury glass bud vases filled with some of the most gorgeous blooms you've ever seen! I knew I wanted to include something handprinted, so I turned to our friends at Paperfinger. They created these gorgeous watercolor table numbers and signs. Underneath each guest's water glass was a simple orange cocktail napkin embossed with the bride-to-be's initials. Thanks to Aromachology, we created a gorgeous and interactive perfume bar. Guests learned about scent creation and each left with their own personalized fragrance that they designed themselves. What an amazing shower activity! 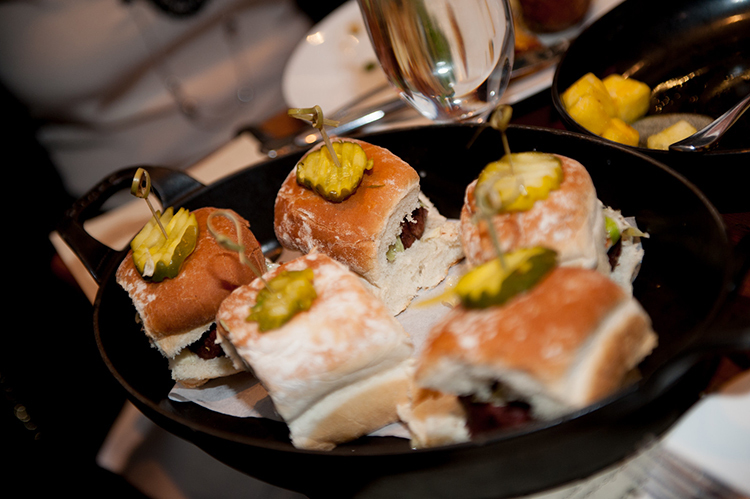 Now, let's talk about the food. It was really amazing. And to make it even more amazing, I had these cute little toothpick flags printed up. How delicious does this look? Everyone loves a cocktail on an autumn Sunday, so why not 3 different mimosas at our pretty and seasonal little mimosa bar. 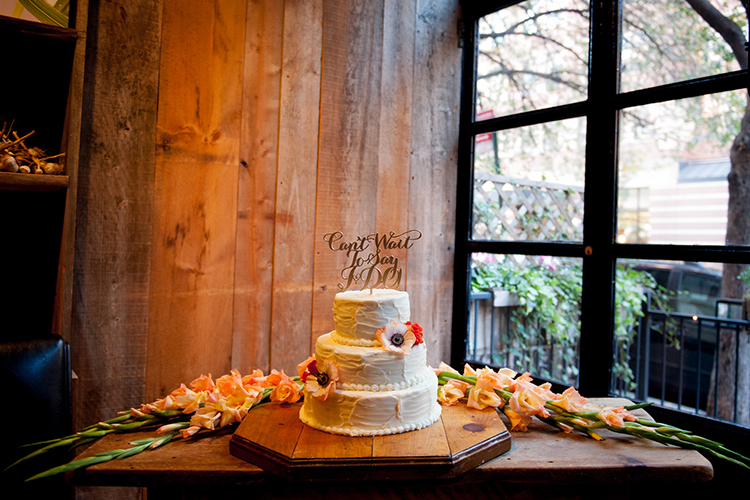 What do you do when you have a plain white cake and some extra flowers? Decorate it of course! It was a fabulous day filled with family, friends and lots of laughs. Cheers to the happy couple! All photos were taken by the lovely Steph Mann.